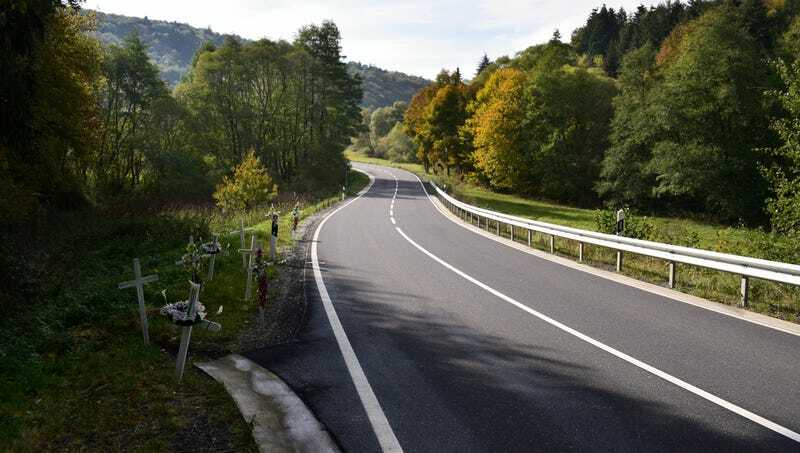 CRYSTAL RIVER, FL—Claiming he found the turn to be well banked and cambered with perfect sightlines, motorist Calvin Henry declared Wednesday that a bend along Florida State Road 44 was definitely not sharp enough to warrant the dozen or so roadside memorials along its outside shoulder. “I mean, this is a pretty soft turn,” said Henry, noting that the section of road in question was barely even noticeable as far as highway curves were concerned, let alone a deathtrap deserving so many combined remembrances and warnings. “Would you look at all these plastic flowers and white crosses? Either the people around here don’t know how to drive or they’re just goofing around. It’s not like there’s even a steep drop on the other side of the shoulder. Seriously, people, calm down—I could take this curve at 80 without breaking a sweat.” Henry was unavailable for further comment, having become so distracted by the abundance of memorials that suffered a violent single-car accident.